No matter how long I practice I know I will run into cases that challenge my knowledge and frustrate me, but that ultimately I learn from. When I first met this patient she already had upper and lower implant hybrids in place and had fractured the upper right lateral denture tooth off. Additionally, she shared a history of fracturing and wearing down her teeth. She had several single unit implants placed to replace individual teeth, then ultimately had her remaining teeth removed and using the implants for dentures with locator attachments. That only lasted about a year as she couldn’t keep the dentures in, no matter what they tried. She went back and had additional implants placed and upper and lower hybirds constructed. Since then she had replaced an upper lateral or canine denture tooth 4-5 times. She and I replaced several of the upper anterior denture teeth over a year period, each time having to take off the hybrid and replace all the screws. After looking at mounted models and evaluating that she had a history of extreme parafunction and had been restored in her hybrids with canine guidance and relatively steep anterior guidance, I made the recommendation that we reset the upper hybrid, open her vertical and try and shallow and balance her occlusion as much as possible. Given the limited amount of space we had to open vertical, we accomplished spreading out the time between fractured teeth from months to once a year. During this process we made the patient an occlusal appliance over her upper hybrid, which she wore faithfully. So of course, I took it personally when I’d see that emergency visit on my schedule. At a “lunch and learn” I was sharing this story with Tom Wiand of Wiand lab and I watched his face light up, before he asked me a question: “How high is her smile line?” The answer was: “It isn’t, she has a very low lip line.” That was the right answer and Tom had an idea for me. We took upper and lower impressions of the hybrids, facebow, bite records, fixture level impression on the upper arch, and shade information. Wiand lab stripped everything off the original bar. 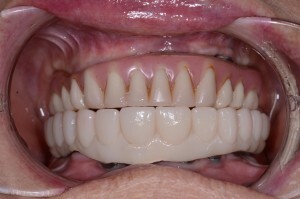 We then sent the entire case to Gold Dust Dental lab, where they waxed the upper to full contour over the bar. The case then went back to Wiand and they used an injection-molded composite to fabricate a one-piece upper over her original bar. I am happy to say (while knocking on wood), that it has been a long time since we have had anything break, chip, or need maintenance in this hybrid overdenture case. People who are hard on their teeth will be hard on restorations, and implants aren’t a magic solution for patients who are high risk occlusally. Once again I realized that I have great partners and resources in both the labs I work with and am pleased I followed their advice.